Emma Itzstein may not be living in Perth anymore, but we've decided we can still claim her. The Perth-born, Geelong-based artist has only been painting full time for a year, but she's already making ripples in the Australian art scene. And trust us, the waves will come. Flying into Victoria with a bunch of awards under her belt (mostly for her unique state prints), Emma has switched her medium to painting. Her earthy and pastel native Australian florals, set on a dripped-paint background, are incredibly distinctive. And we're not the only ones who think so. Emma's landed herself a debut exhibition at Brunswick Street Gallery. It's called YIN, and it'll run from 22 August until 4 September just in case you're planning a trip to Melbourne any time soon. We advise picking up a canvas before these babies appreciate 100000%. 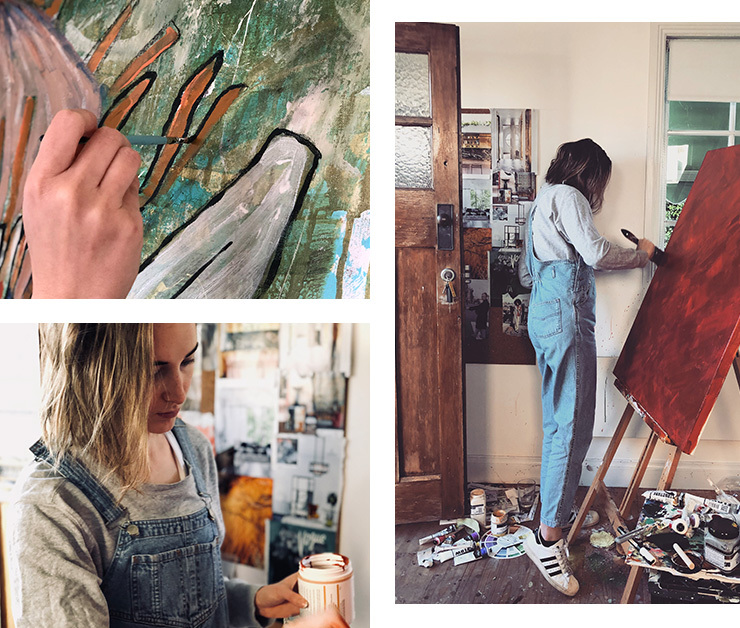 We sat down with Emma in her studio and chatted all things art, Instagram and inspo. I grew up with my Grandpa painting, and my Grandma was a dressmaker. We were always mucking around with creative things when we were little. I did art at school and I loved it, so when I got into law school in Perth I knew I had to always keep up art as a creative outlet to not go crazy. A year ago, I decided I wanted to give it a crack and do it full time. Nothing else was making me as happy. I’m still fairly new to having my own art practice, so it’s a balancing act between giving myself space to find and develop my style, as well as marketing myself and putting myself out there. Definitely the idea of perspective. I’m inspired by trying to look at things in different ways and trying to make sense of different things. I’m obsessed with nature in particular, obsessed with the ocean. I love the little, simple pleasures of life. I start with the background. I go for the colours that I gravitate towards and build my palette by whatever I’m feeling on the day. When I feel like the background is done, I have to step away and give the piece space, unravel what’s in my head. Then I start with the florals. I think it’s always worth thinking about a piece more and trying to approach it a different way. Flowers are kind of the universal symbol of stopping and being present in the moment. You know, ‘Stop and smell the roses’. So they’re a nice symbol for being mindful and admiring the everyday beauty around us. Instagram is a new and vital tool for artists, definitely particularly around marketing yourself. Before, you had to rely purely on gallery representation, but now you've got the tools to represent yourself. It's great. It can be tricky though: you have to try and find the right balance between how aggressively you promote yourself, and how often or not you post. For me, no two days are the same. I could be in the studio painting, packing print orders, doing a photo shoot with a local creative or updating my website. I’m still in the early days, in terms of having a proper art practice, so every day I’m learning new things. Moving away from home put me in a position where I couldn’t not address my anxiety anymore. My printmaking in Perth was not an introspective practice. It was more observational, focusing on things not directly related to me. YIN is basically an exploration of abstract botanical act. But it's also a symbol of my experience with generalised anxiety. It’s a static representation of introspection and expression. You can check out Emma's new work at Brunswick Street Gallery from 22 August – 4 September. Follow her on Insta here.